Bad movies we caught this week. What’s worth watching and what’s worth using as a coaster? 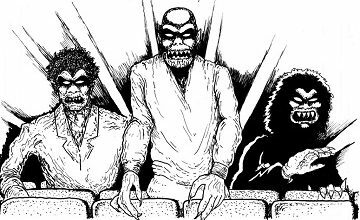 Laser Blast an infamous flop, lampooned on Mystery Science Theatre. What springs to mind when you think “laser?” Maybe Austin Powers or James Bond but not…a silly cannon and an amulet. 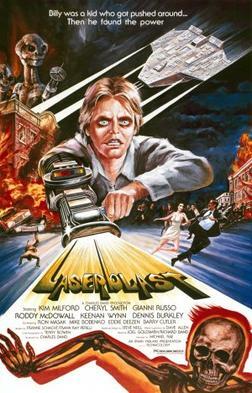 LaserBlast is about a loner who discovers an alien laser cannon and goes on a rampage, seeking revenge against those who he feels have wronged him. With a plot like that, how can you go wrong? Roddy McDowell (who’ll work in just about anything) is in this. He plays a doctor but don’t get too excited – his appearance lasts for all of five minutes. The film features a tennis racket battle. There are also turds that look like Claymation. Also, two nautically-themed features: Open Water and Caught Inside. The former features two SCUBA divers who are abandoned by their boat and basically have to survive the open seas. Also, Caught Inside an Aussie movie about a surfing trip gone terribly awry. “Bull” an alpha male who looks like Bret Hart with Iggy Pop’s DNA spliced in. His travel mates get a sense of just how loony he is, after a fight with a fellow surfer. Gnarly, dude.